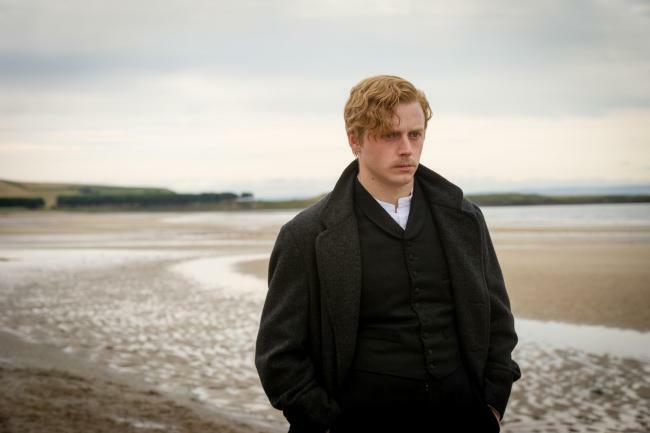 The 70th Edinburgh International Film Festival opens with Jason Connery’s Tommy’s Honour, the story of the early days of professional golf as well as the life and career of Tommy Morris (Jack Lowden). Don’t worry too much if you aren’t all that into Golf. It’s not something that interests me greatly so thankfully the story doesn’t really focus on it all that heavily. 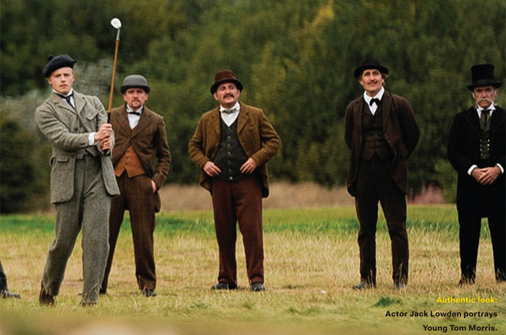 It is a significant part of the backdrop and many scenes involve the characters participating in various competitions but the film focuses more on the Golfer than the Golf. Tommy is a really likable guy who starts off being wide eyed and idealistic before letting his confidence grow as he starts to become more comfortable with his ability on the Golf Course. Jack Lowden creates a lot of empathy for this character and the way he conducts himself is constantly endearing. He carries the film well and we see lots of different sides to him through his relationship with his father Tom (Peter Mullan), his eventual wife Meg (Ophelia Lovibond) and various people that live in his home town. Arguably his father is almost as much the focus as Tommy is. Petter Mullan injects his own brand of authority into Tom by being soft spoken yet able to lay down the law when necessary. His soft spoken and deliberate nature are definitely not to be taken lightly and the film creates a believable dynamic between father and son as Tom supports Tommy as much as he challenges him. Their scenes together are definitely the strongest. Tommy’s immediate surroundings are fairly small and there’s a real sense of old fashioned community spirit about the place. The old people are treated with respect and there’s a particular way of speaking that is clearly native to that part of Scotland. It all feels natural an authentic which makes the setting feel all the more real. It became easy to invest in Tommy and the people around him when his surroundings feel like a real place that people might live. Structurally I found the film to be a little odd and a lot of it had to do with how unfocussed the narrative could be at times. At some points it was a biopic about Tommy and his life but large chunks of it would be skipped to the point that I wasn’t sure how much time had passed. 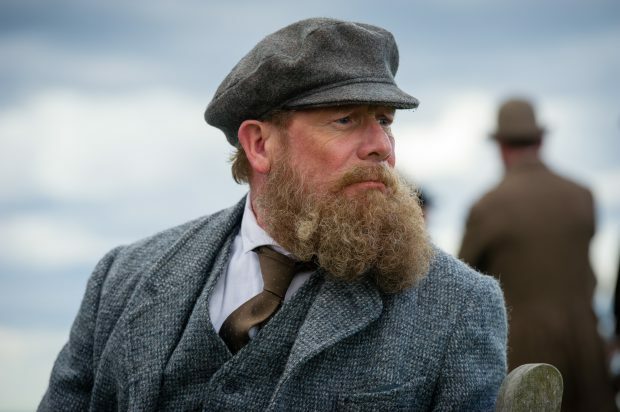 This happens frequently with only Peter Mullan’s facial hair as an indication of how much time might have passed. The transition from mutton chops to a full on beard almost becomes a character arc in itself. Other points were about the growth of Professional Golf and how much influence Tom had on designing some major Golf Courses. For the most part this is paid lip service without much in the way of development. I suspect this is due to the fact that Tommy’s life story was more interesting but the historical aspects distracted from this at times. The film does have a really good sense of humour with some real laugh out loud moments peppered throughout. Notable highlights include a jab at female Golfers and waiting for a horse race to pass before crossing to where the ball had landed. The broad use of humour kept the tone of the film really light and prevented it from drowning in the rare moments of emotional intensity. A lack of focus to the narrative becomes the films biggest problem as it didn’t really feel like it was about anything since it was trying to be so many things at once. In some ways it’s more of a collection of scenes than a coherent narrative. Some of these scenes work well and others work not so well but the lack of focus definitely lets it down some of the time. An enjoyable film with great peformances from Jack Lowden and Peter Mullen. The film has a really slick sense of humour about it that keeps things entertaining but suffers from a lack of narrative focus that makes it feel like more of a collection of scenes rather than a coherent narrative. It doesn’t drag it down too much but with some trimming and a greater sense of focus the experience could have been far richer.